Any opinions on this specified torque for the manifold? Seems very light on at 25 ft/lbs, I thought 40 was about right for alloy or should I just go with the 25 recommended? Location: Southern Sweden - Sturkö island Go with the recommondations Marc, tighten it down to 25 ft/lbs, make a start up, let it come up to working temperature and retighten again. Indeed a little low, but as the supplier has recommended 25 ft/lbs, I'd follow it. Location: Southern Sweden - Sturkö island Also, now with your carb sitting higher up than Before, you must check the throttle valve lever adjustment. It's the rod that goes downwards towards the transmission. On the lever on the transmission, there should be a rubber bushing - perhaps mushy or disintegrated by the years - get a new rubber bushing and adjust the throttle valve lever according to the fsm…. For some reason its worked ok up until now. Generally warms up and was completely off the choke within about 5 minutes so I guess it was working fine? How do you set the choke to lean? Depending on outside temperature, 5 minutes can be a very long time. The heat riser, or some kind of intake/air warming device, wasn't added to every production carbureted engine without a reason. Think about the money they could have saved omiting it. Heat risers save fuel and keep the piston rings/cylinder walls and spark plugs happy. They also can prevent carburetor icing, which can happen even in above freezing temperatures. It is a simple little device that requires very little service (a drop of heat riser lubricant, 20 seconds of "work" a year). An engine rebuild is more work, more expensive and takes longer. So why not using a heat riser valve? I personally don't get it. Again, check the color of your heads intake ports. That is not from a properly running engine. The intake ports are usually clean and dry. Okay, just notice your location is Sidney, Australia. So maybe it is not that important down there. Yet, heat risers help, even in 20°C+ weather. Location: Sydney Im a little confused as what the heat riser actually is? Is it the flap in the exhaust, the channel that directs hot exhaust through the manifold or the whole system? Im not sure what I should do now with regard to the wet intake ports? It was such a mess that it was impossible to tell where oil was coming from. All cleaned up now, new valley cover, new manifold, carb kit, new threads in head etc and will have to see how it goes. There was excessive blow by coming out the breathers and I thought maybe the rings were worn but it uses no oil. I though maybe valve guide seals but again, uses no oil and blows no smoke. Im wondering if some exhaust gas from the manifold heating channel was leaking past the old valley cover and manifold and pressurising the crank case? If this was the case, it should now be fixed so will be interesting to see what happens. Im not in a position to take the heads off at the moment so with a bit of luck things will be much better now. Location: Southern Sweden - Sturkö island The heat riser is the butterfly valve that closes when the bi-metallic spring cools down. 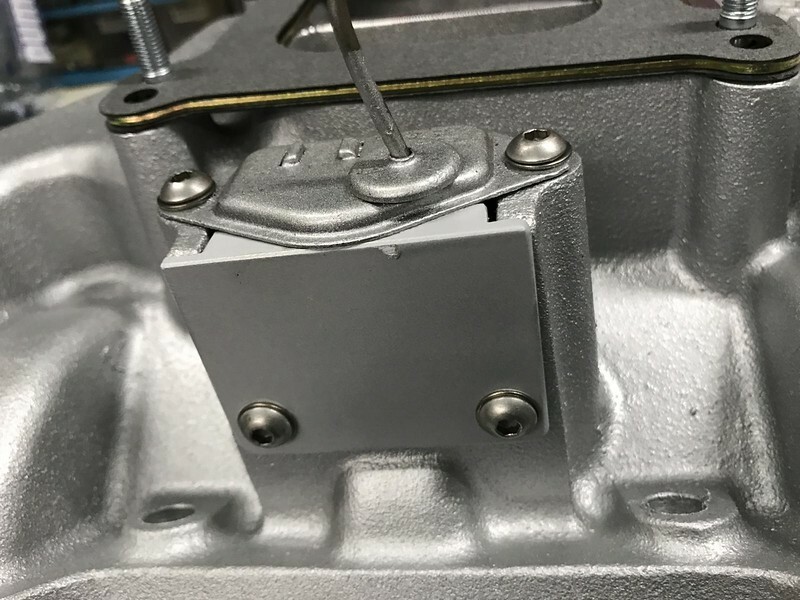 The exhausts from the right exhaust manifold is forced up and through the channel in the intake manifold and goes out through the left exhaust manifold. This makes the heat rising in the intake manifold and the bi-metallic spring in the choke well is starting slowely to open the choke valve. As the bi-metallic spring on the butterfly valve gets hotter, the butterfly valve starts to open and the exhaust is going out throgh the right exhaust manifold as well as the left one. So do I assume that mine is permanently open then? At the exit of my header there is a rusty old shaft but nothing attached and its solid. Location: Southern Sweden - Sturkö island Not necessarily Marc, it could be freezed in any position. Try to spray some good rust solvent on the shaft. try to wiggle it when the exhaust manifold is hot. The counterweight and bi-metallic spring would not be to difficult to find, perhaps even locally. It's a good sign that the shaft is still there, it might mean that you have the valve as well. Location: northern germany Yes, the bi-metallic springs in the intake AND exhaust manifolds work as a team, part of the same system. 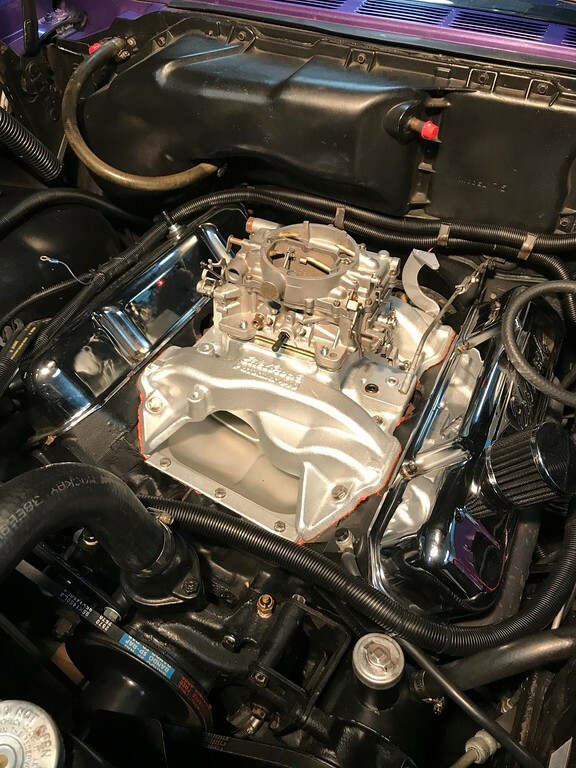 Running without the heat riser will make the choke stay on alot longer and also will make the engine run inefficient as fuel/air mixture will condensate on the cold intake runner walls and run into the combustion chamber, leading to fouled plugs and cylinder wall oil washdown (piston ring/cyl. wall wear). Keep in mind, that most of the engine wear occurs during cold starts/warm up and a heat riser will cut this time significantly. In around 10C° weather my carb is on the fast idle cam maybe 30-40 seconds. With an aluminum intake and a working heat riser the intake reaches operating temperature in a very short time. I didn't mean the gunk in the valley pan, I meant the residue IN the intake port channels of the heads. These are usually clean and dry. Location: Sydney Could the oily intakes be due to the PCV into the manifold? Could the oily intakes be due to the PCV into the manifold? Yes, unless it was connected to only one intake runner. I always advice to run the factory draft tube/breather. Feeding an engine hot, oily (mostly) exhaust gas, can't be a good thing. It may be better now. They used to make a mess and stunk up the car. Location: Southern Sweden - Sturkö island As Sid writes, it might be the PCV, but then again you didn't had it for very long? The residue looks to be an older thing, which might indicate too rich nozzles (hows the CO² Reading?) For to really understand if the carb works as it should, one could add a lambda sond with a digital panel discretely mounted (as our Herman did on his 60' RAM NY). I agree with Sid on the PCV - it can never be any good for an engine to add exhaust and gunk to the fuel mixture. I is good for the ambient and it works better with modern engines with less blow-by. Location: Sydney Ive ordered another open breather. Hopefully all this work will have paid off. Location: Southern Sweden - Sturkö island Just for comparison and since I'm renovating the Carter carburetor, here's how your intake channels should look like, also in the heads. 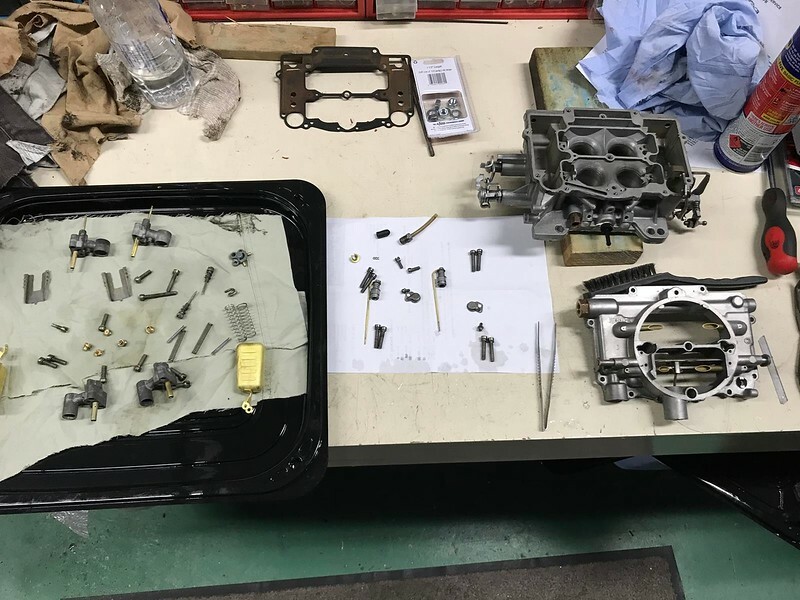 This is after 58 years - I have not seen any evidence that the carburetor was ever opened. The inside of my carburator gives me some support in that theory. Cant believe the carb was so full of rubbish and rust! There is 3 filters between the tank and the carb since Ive owned it! Need to clean the excess sealant off the manifolt when it dries propely. Location: Sydney My carburetor looked about the same as yours! The inlets in the manifold look about the same as mine too. The manifold isnt oily and wet as the inlets in the heads are. I will have another look at the old manifold tomorrow. Just for comparison and since I'm renovating the Carter carburetor, here's how your intake channels should look like, also in the heads. Location: Southern Sweden - Sturkö island Yes Sid, it's really amazing that they built cars with components that still works perfect after all those years. Anyway, when I cleaned everything, I noted that the the carburator has been opened, I saw some gasket cement and the gasket was cracked. It'll be interesting to hear how the new manifold and the cleaned carburetor will work. The kit I installed was a little dubious in some regards, two of the smaller gaskets were not correct, had to use the old ones in the secondary nozzles (dont know what they are called, and the piston on the accelerator pump seemed a little small going onto the taper and slightly smaller than the one that came out but I thought the leatherette cup may swell?? Ill pull the top off while in the car and check the pump piston. Location: Southern Sweden - Sturkö island Aha, if it's an old leather type, you should have soaked it in gasoline for a couple of hours for to let the leather swell up. That said, perhaps the lether will swell up anyway, now that it's soaed in gasoline. I presume that you installed the ball valve in the bottom of the accelerator pump well? Also, the upper back valve under the accelerator pump outlets? Location: Pacific Northwest Looking pretty snazzy! Its the only one available here that I know of. Yes the ball valve went back into the pump housing wall and the brass needle went in under the pump nozzles. Maybe I should wait and see if it swells? Location: Southern Sweden - Sturkö island It'll swell Marc, just a matter of some time. Your Engine bay looks nice now! Location: Sydney Ill see what its like in the morning. Should have had enough time to swell by then I would imagine. Hopefully get a drive tomorrow. Location: Sydney Accelerator pump is now working and seems to be pumping as it should. Just needed to soak for a bit. Went for a little drive and its quite a significant improvement. Pulls much harder and very smooth. I did also replace the complete ignition system at the same time though. On hard acceleration from low rpm, it hesitates and even back fired through the carb. This was at the recommended timing of 5 degrees (not the standard 10) recommended by the seller of the ignition. I did then advance the timing to the standard 10 degrees and this stopped the backfire through the carb at hard acceleration but now it pings lightly. Sounds to me like too much advance? Maybe I should start a new thread for this? Location: Southern Sweden - Sturkö island It sounds like you've got a lean spot in the fuel supply Marc. Edelbrock sells a step-up needle spring kit - you could buy that kit and try with the max hard spring first and see if the hesitation and ping goes away. If so, change to the next weaker spring and check again. 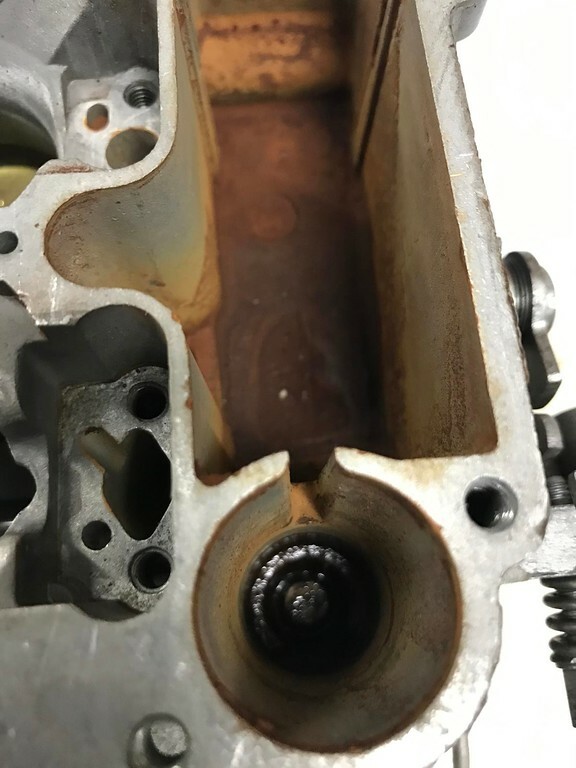 Then check that the timing mark corrosponds to the TDC by removing the #1 sprk plug and feel when the piston is in TDC - check that the timing mark on the harmonic damper is corrosponding to 0º. I had a NY '61 in that had the harmonic damper disintergrated and the timing mark was off by 20º...…. I set my timing at 2,5º for to get the (for my Engine) correct timing - this Winter I'm going to recheck the TDC and most probably change the timing gears and chain. It looks like you still have the oem timing chain and there must be some slack after 58 years of service. I did check TDC when I got the car, I had to as there was no visible mark on the balancer. Who knows how it was set prior. Definitely a fuel issue after another drive, big hesitation when putting the foot down and pinging badly at WOT. Steady cruise and accelerate and it pulls like a train, big improvement. Surprised the manifold made that much difference! Location: Sydney Just want to confirm with you guys that the float height spec I have is 7/32 up and 3/4 down? Could not find anything specific to this exact carb (3108) but thats whats in my manual for Carter AFB 4 bbl. Everything I find on the internet specifies 7/16 up and 15/16 down. I set mine to the manual at 7/32 and 3/4. The manual also states the floats are handed but mine do not appear to be? Location: Southern Sweden - Sturkö island Marc, once you get the car running properly with the correct carb calibration, I'd be very interested to know the average fuel consumption. As a bench mark, the 59' Imperials (heavier) had a consumption of average 1,7 liters/10 kilometers when tested new. I might be nuts but from looking at the pictures it seems the oiling issue is related directly to the valley pan. Some thing else I noticed is the cross overs and lack of carbon build up opposed to the very rich intake ports. I simply do not like edelbrock at all. I prefer offy or wieand. Also performance carbs are for that, performance, great on highways. What I have found is something I was told a long time ago, 95% of carb problems are electrical. 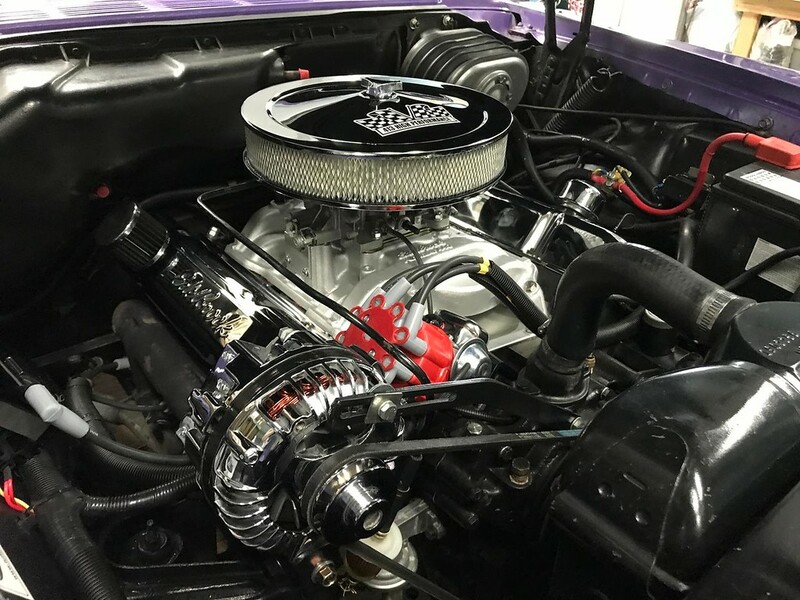 It seems to me if you have edelbrock performance intake/carb with high performance ignition to match all would go well. Location: Sydney I studied the advance curve with the timing light and it appears to be very wrong when compared to the original. For example, the factory mechanical starts at 500 rpm and maxes out at 2300 rpm. This new electronic ones mechanical does not start until 1800 rpm so totally unsuitable. I think this may have a lot to do with the hesitation as I only have a small amount of vacuum advance in the lower revs and no mechanical! Im going to take it to be recurved back to standard or close to it before messing with the carb anymore. At least once the distributor is correct I only have to worry about the carb which may come good. Location: So. California Or...you could just swap the weights and springs from your current distributor onto your electronic one. You don't need a re curve machine if you already have what you want and have the weights & springs right in your hand. Just be careful when you press out the pin in the shaft, to not break the plastic bushing at the bottom of the distributor. You might be able to swap the electronic parts into your old distributor too, but I don't remember if the top of the shaft swaps out or not. The difference in housings is just that part where the wires exit, which is easy to modify. Or...you could just swap the weights and springs from your current distributor onto your electronic one. You don't need a re curve machine if you already have what you want and have the weights & springs right in your hand. Just be careful when you press out the pin in the shaft, to not break the plastic bushing at the bottom of the distributor. What a good idea, I will check it out, thanks. Location: So. California If I remember correctly, I believe the top of the shaft that has the lobes for the points to ride on, will swap out, and you can just install your electronic parts into it from that point. That makes it so you don't have to press out the pin in the bottom and take out the shaft. You can just replace the parts at the top of the distributor to convert it to electronic function. Hopefully I am remembering it correctly. 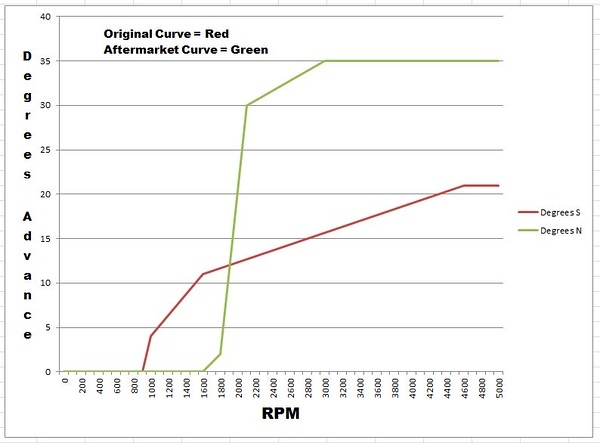 I plotted the original and the aftermarket distributor advance curves. Hardly surprising the car ran like crap and was pinging its head off! I cant even imagine what this curve could possibly work with! Also replaced the chinese module with a Bosch with variable dwell. Ive kept the original distributor as is unmodified, I like to keep all the original parts unmolested and will use the new one with original curve. I can only guess that my poor running problems will be over. Choke thermostat that was mentioned earlier. Intake bolts should be 50 ft lbs in the service manual. Where did 25 ft lbs on the intake bolts come from? Location: Sydney Since getting the distributor re-curved back to standard it was seemingly running lean. Was getting some weird hesitation and pinging since putting it back together. Seemed to be fuel related now that the timing is back to the normal curve. After numerous tests an re-tests, finally got the jetting sorted for the new manifold. The Edelbrock manifold seems to flow a lot more air. So if anyone is interested, here are the final results. I did not replace jes but resized the original jets a number of times. Metering jet spring, maximum, approx 10 hg, (standard spring was already as hard as the hardest Edelbrock), so used one I had that stiffer than all of them. This has removed all hesitation and all pinging and going great at all revs. Location: Locked in my Canadian garage.... Geeez. Never saw this thread. Oil pooling? You have lots of blowby.... pour some solvent in your old valley gasket, see if it trickles through a crack. I've seen quite a few cracked original valley pans. What is your total timing? If iron heads I'm not sure I would run more than 34-36. If you have 10 degrees initial you would need 24-26 degrees mechanical advance to do that. Are you running the vacuum advance or is it plugged? Location: Locked in my Canadian garage.... If you change the springs/weights in your distributor it will change the RATE of advance in your distributor, but not the total amount of mechanical advance. Some aftermarket distributors allow adjusting total mechanical advance, some need slots elongated or welding up.... depending on your need. Location: Locked in my Canadian garage.... Never mind, I see you got it sorted!! What distributor did you buy that had that curve in it? Never mind, I see you got it sorted!! N & P performance Parts. Clearly a faulty unit but they will not reply to any emails. I even sent them the plot. Hm said it before and I'll say again. Not only the heat risers but the cross overs being blocked can cause hesitation and this goes to choke issues. 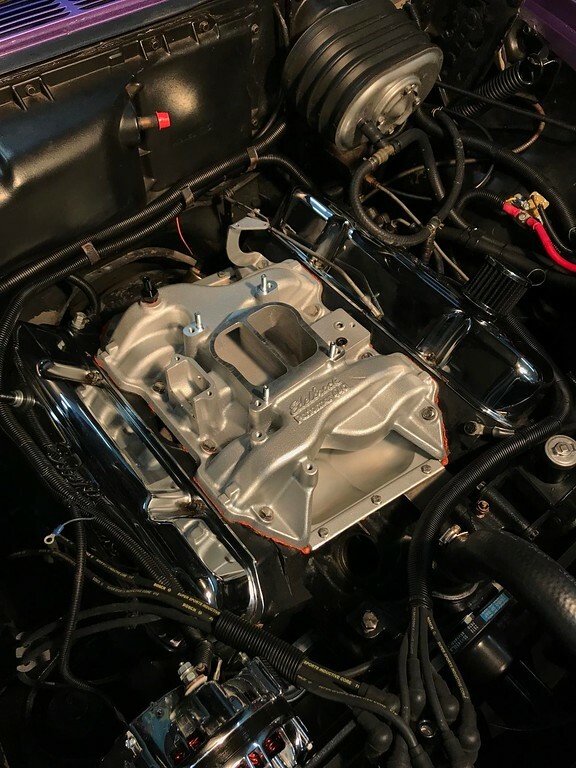 Did that edelbrock intake block off the cross overs? If a racing engine not a problem, but a daily driver is a problem. It heats up the intake under the crab to help fuel dilivery and atomization in cold start up and chily temps. I wish you the best but wondering if in the work you did if checked the play in the timing chain? No, the heat riser is working as it should and the choke works perfectly too. Was purely a jetting problem, now completely resolved driller out the jets a couple of sizes to accommodate the better airflow through a good manifold. I did have to rework the choke cavity though and make a cover to fit the original choke, closed it up to retain heat, but works great.